In this journal we obey the laws of thermodynamics! Failed the full Advent calendar experience, but hey, there's still 2 weeks to Christmas! Here are a couple of songs to get you in a wintry mood, even if it hasn't been cold where you are. Admittedly, I don't know exactly how it works. But still. I can see it putting together the Halloween mix and The Crow and even Roadkill. But Loreena McKennit and Ashley MacIsaac and the Cowboy Junkies? Kirsty MacColl? HOW DOES IT KNOW? From the right angle, I like to think it's Kate Winslet. Those who have met me, feel free to start pointing and laughing now. With many thanks to Cover Lay Down, please listen to this amazing rendition of Warren Zevon's "Roland the Headless Thompson Gunner" by Naomi Bedford. Phenomenal. I will be checking out the rest of the album; if you liked Nick Cave's Murder Ballads, I suspect you should do likewise. My dad called this morning to say M is doing better. Boyfriend has heard the awful news and was great, likewise her parents. So that's good. I forgot to mention in my previous post, but the last time I saw Sam he also peed on my living room rug (brat). After they'd left Jen said "He's very sweet, but he kind of looks like a Fraggle." Which is true - his ears were tufty and stuck out sideways. Apparently you sometimes have to tape terriers' ears down for a while so they'll fall right? SO BIZARRE. I only met Sam 3 or 4 times. The last time I saw him, M had brought him over for a play date. We took the dogs to the off-leash area on the beach, where they garnered many admiring looks as a fine handsome pair of Airedales should. He'd grown taller than Blue by then, much to M's surprise. 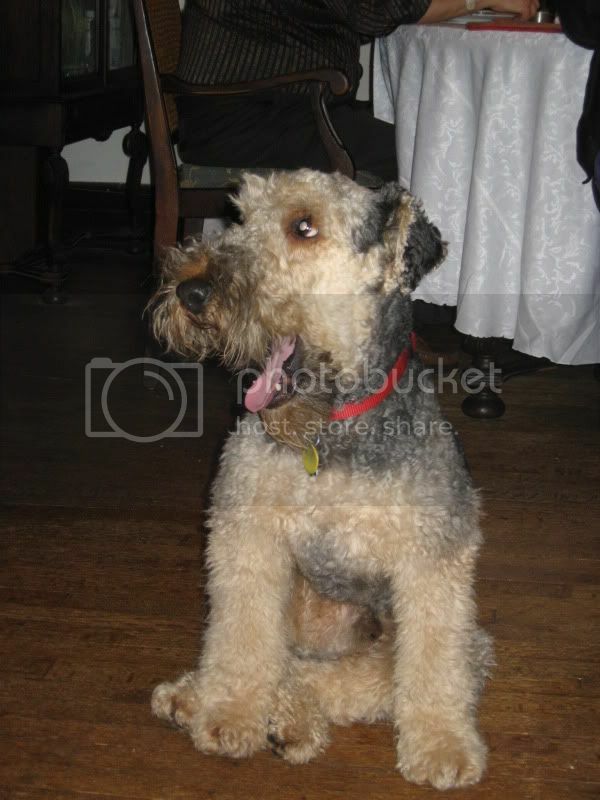 He was bouncy and friendly and full of energy - a typical Airedale puppy, in fact. He was a struggle to bring up because of all that energy, but M and J were doing a great job and he was learning. He should have had much longer. Someone brought M home and sat with her, and at some point she called my parents who called me, and also the police. We met her at the door, hoping for a miracle, and went down to the river to search. The police searched too -- at least 2 cars and the Marine Unit. I am so impressed by the police response. But nobody found anything. The Humber moves fast, and it's wide, and right now it's almost covered with rotten-looking ice. I climbed down the bank in a few places and kept well away from the edge, hanging onto trees. If you fell in you wouldn't come out. I was shocked when I saw it. There's no ice out here in the Beaches, nor in the Don apparently. My new rule: no rivers. Lakes are OK. Rivers are treacherous. There's no better feeling than walking into your home and getting a joyous greeting from your dog. It was so hard to go back to the apartment and see all the dog toys and blankets and dishes and crate. M said "He should be here." I hope it was quick enough that he didn't have time to be too scared. I am so sad, and there's nothing anyone can do. M was distraught. She blames herself: for letting him off the leash, for not looking after him, for not calling 911 sooner, for not doing something different that would change the outcome. She keeps seeing his face as he went in. To make it even worse, her boyfriend's in Korea on business. We all make stupid decisions and mistakes sometimes. It's just luck that most of the time, nothing bad comes of them. This time Sam wasn't lucky. I came home and hugged the dogs and wished things were different. When Robin brought them over this morning, she warned me that they were (surprise!) wet, so I cleverly closed the bedroom doors to protect the beds, and went to the computer. A few minutes later, Tilde came upstairs, started scratching industriously at my bedroom door, and waited for me to open it when I came out of the study. When instead I took a towel out of the cupboard, she rolled over onto her back, waved her paws in the air, and cooperated completely in my efforts to dry her off. Now they're both sacked out on the floor, snoozing. I just caught up on the Flashpoint season finale. Jen and I reckon Nicholas Campbell, Paul Gross (to whom Jen refers to as "Men With Brooms Guy" for reasons that are obscure to me) and Dylan Neal have a future as patriarch and warring brothers on some all-Canadian family drama one day. Too lazy to embed, but click those links and tell me we're wrong! We left the dogs at home for a couple of hours, which in most households is perfectly fine, but came back to find Tilde had made her way upstairs and expressed her disapproval in rather biological terms. Sigh. Blue didn't eat anything he shouldn't though! Merry Boxing Day/Happy Feast of St. Stephen! I ate way too much yesterday but had a fine time with both sides of the family. (Eggs Benedict/Florentine/Benjamin and fruit salad with mum's side, then turkey dinner with million trimmings with dad's side. Champagne and hilarity throughout.) Thoroughly spoiled. Parents are coming over later for Boxing Day tea, which means I should probably make a bit of an effort to tidy up. As always I left wrapping to the very last minute, and I have to sing the praises of Japanese decorative tape because it SAVED MY LIFE Christmas Eve. My packages are now about as minimalist as it gets - giant roll of Kraft paper, decorative tape, occasionally some fabric ribbon, sticker or tag. Everyone seemed pleased by what they got, hurray! I also went to "Babe in the Barn" at Riverdale Farm Christmas Eve, and was part of a hastily improvised choir (my mum and I were the only female members) intended to encourage the audience to sing. You start off in the drive shed, follow the shepherds down to the outside of the barn, pick up the three wise men, quick stop at the Simpson House steps for a scene with the innkeeper and his wife, then into the barn for the full Nativity scene. (Baby Jesus had a pacifier and behaved very well.) You couldn't hear A THING people were saying, but the singing came off well (I did a descant on O Come All Ye Faithful, which I would never have been able to do if we had sopranos, so that was fun). And there were sheep in the barn and it was actually really lovely, though cold. They don't advertise it at all, apparently - it's a deep dark neighbourhood secret - because if they did it would be even more packed than it was. Now I am off work for a week! I would like to think I'll get lots done but let's face it, I'll probably mostly lie about reading and eating. As it is the Feast of St. Stephen, have a rerun from Day 19 of the Advent calendar.